I had the pleasure of working as the makeup artist with No Frames poductions for a video announcing the acquisition of the WWRD group by Fiskars. For those who don’t know the WWRD group includes iconic luxury brands like Wedgewood, Waterford, Royal Albert and Royal Doulton. Fiskars is a little know company that makes the quality scissors with the iconic orange handle. Take a look at the final compilation video below. Super excited to announce that I have been selected as a VIP Influencer for the DIY Makeup Expo being held by DIY Makeup Mag. 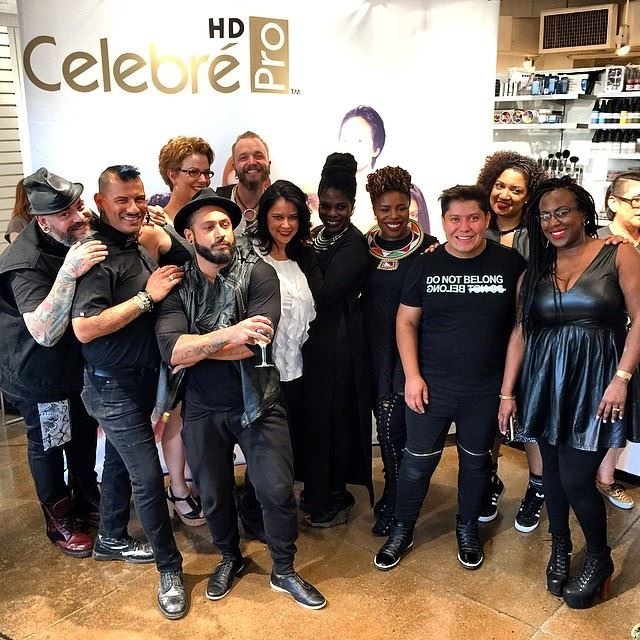 The team at DIY mag selected a group of pro makeup artists and bloggers in the NYC area with unique social media presences to be part of the influencer circle connecting us with brands and tapping into our expertise. 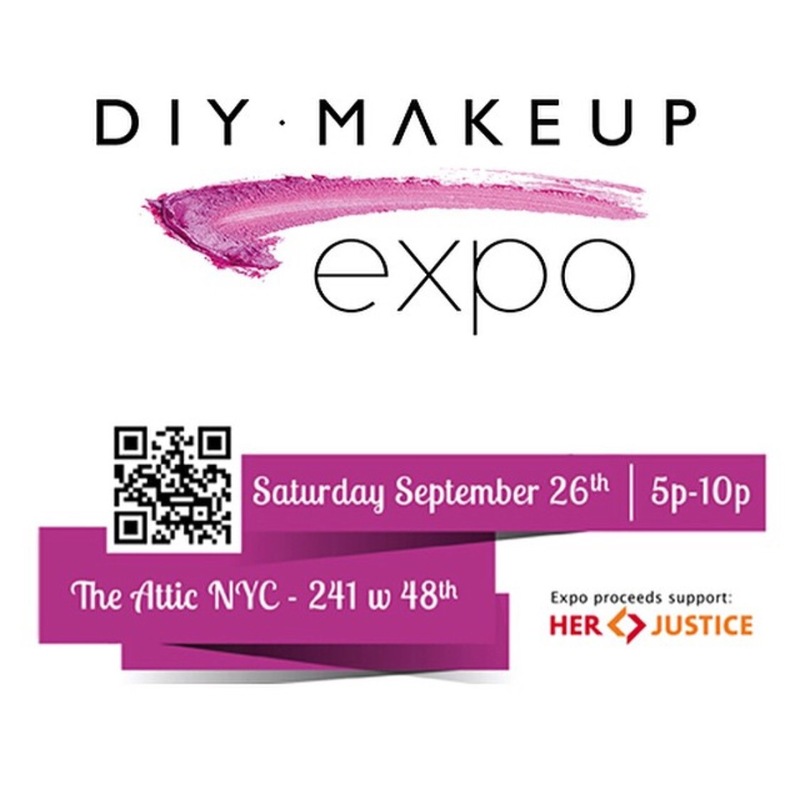 This expo will be the first cosmetics expo powered by social media and I am so excited to see what the DIY Mag team has in store! Find deets about the event below. Tickets for this event are FREE. 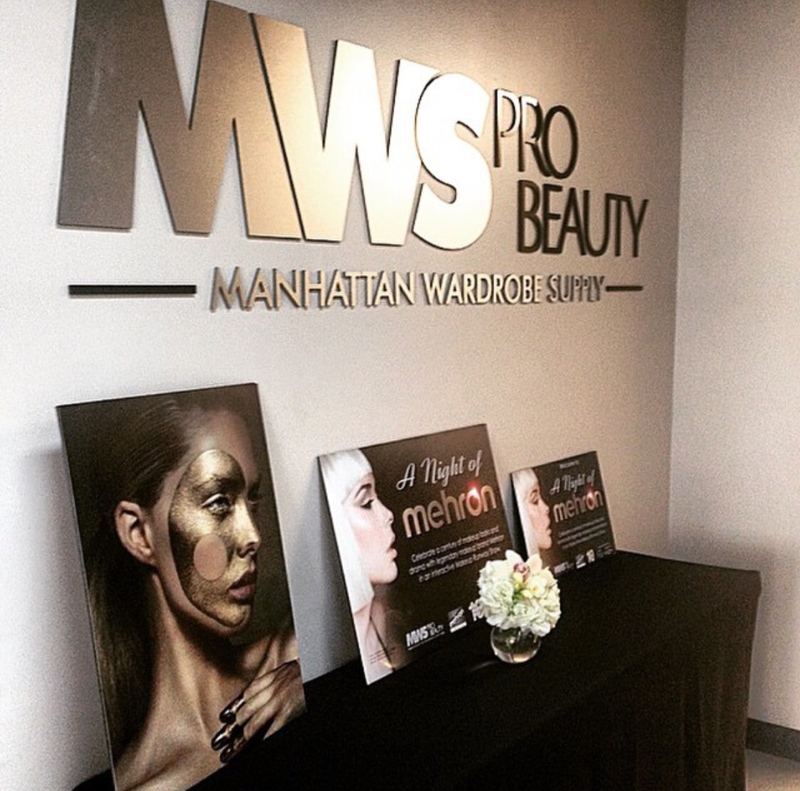 With FREE admission you get access to free makeovers, product samples and products available for purchase. You also have the option of purchasing a VIP ticket at $99 which gains you access to the VIP mix and mingle portion of the expo. But…you know I love a good discount. Use my name “MICHELA” on the eventbrite page, here, to get a 25% discount of VIP tickets. I hope I get to see your beautiful faces there. If you are coming, make sure you let me know!! After just a few years of working as a professional makeup artist, my personal makeup routine has whittled down from a minimum of 3 MAC shadows to a great brow, liner lashes and a great lip. When I want to be fancy, I wear BB cream, blush and highlighter. On a very special and rare occasion I may wear foundation. Yes, I am one of many professional makeup artists who does not wear much makeup. Surprise! With that being said, my brow products are of the utmost important to me. I look for great quality, the perfect texture and of course, I need whatever I fill my brows in with to have some great wearing power. Your girl has minimal natural brows, so I must make a brow where there is no brow, while also maintaining a natural appearance. I received Chella brow and eye products in a swag bag from DIY Makeup Mag and I was VERY pleased with the collection. Never heard of them? 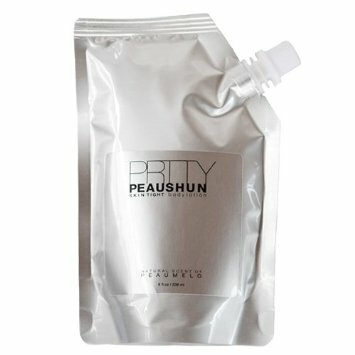 Neither had I, but the quality of products did not disappoint, so I wanted to share more info with you all. Go ahead and scroll down to learn about Chella, one of my new favorite niche beauty brands. [The Brow & Eye Collection] Brow, lash and eye enhancement. 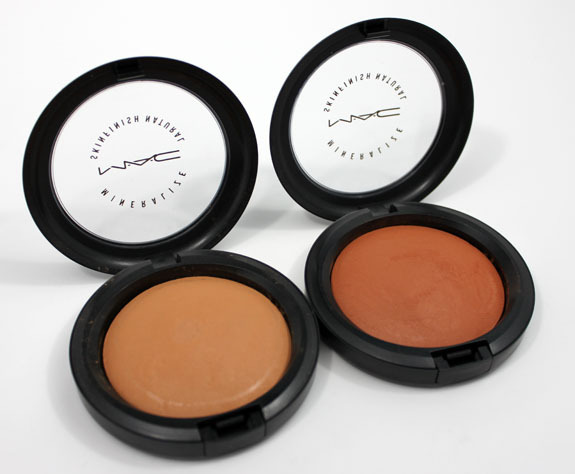 Excellent shade range suitable for all skin tones. You know I’m a fan. A chubby sharpened pencil with neutralizing properties and it’s made for a quick and portable highlighting everywhere situation. Use it to highlight, conceal, neutralize: brow bone, dark circles, blemishes, red spots, water line & inner corners of eyes, down the nose (oh!). 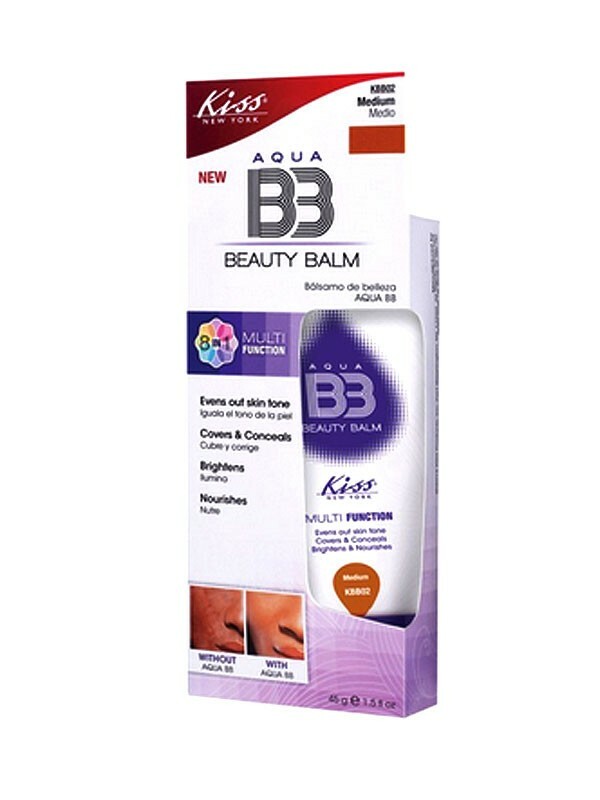 They also say it’s great for lipstick bleeds and eliminating darkness around the mouth. 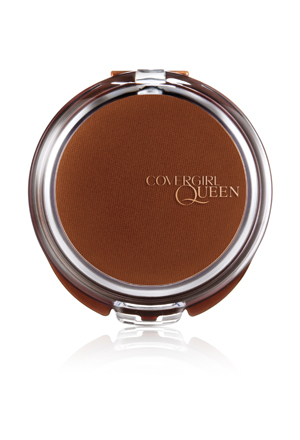 Great coverage without being heavy and surprisingly creamy and easy to blend and diffuse. Available in 5 shades. Listen, Chella done crept up and snatched all my damn edges. There was no denying that they got this absolutely right when I realized that they offered highlighter shades for EVERYONE. 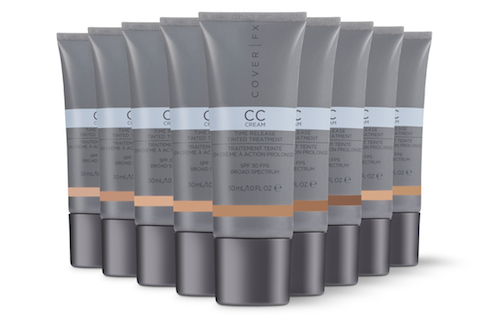 And I don’t mean they just have shades that are supposed to match human skin tones, but don’t, Chella has a shade range to suite most if not all skin tones and the colors are RIGHT! 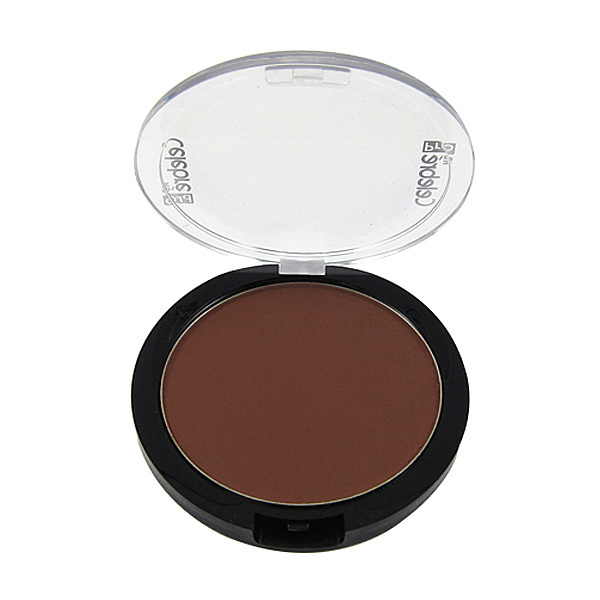 The Espresso is easily a shade I would use to contour my face so it would be a highlighter for someone with incredibly deep toned skin. Praise dance! 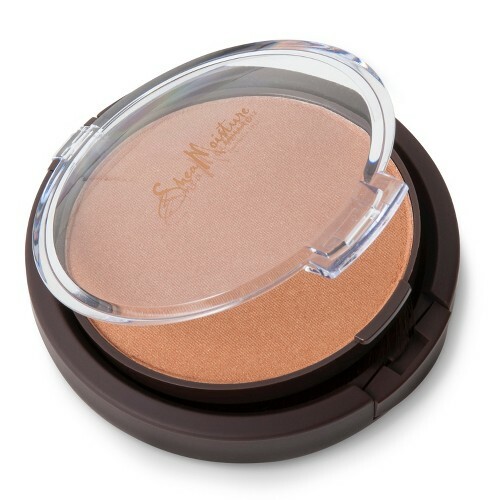 Yall know the brown girl cosmetic struggle. 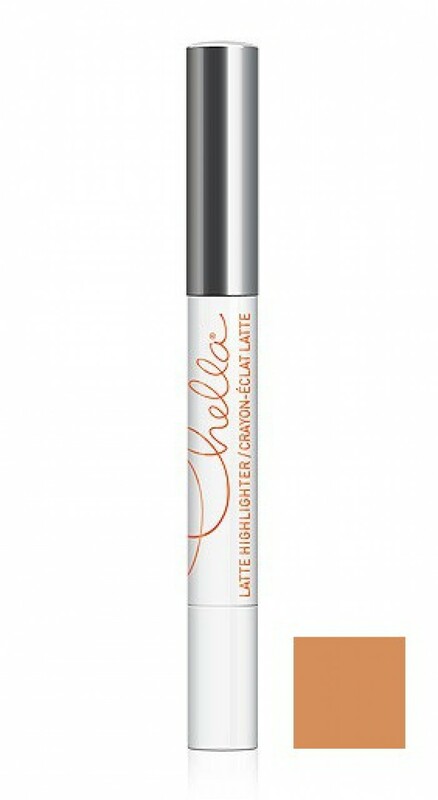 I used this bad boy on set a few day ago and it tamed the most unruly of brows! I’m talking slightly coarse and curly brows. Hello!!! Where can I get this in a jug with a wand? 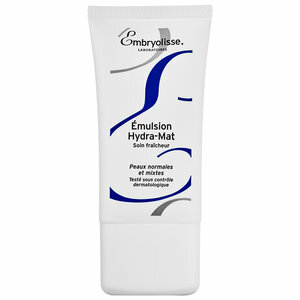 Of the products that I received, the aforementioned were what I was able to try and I loved absolutely every single one. 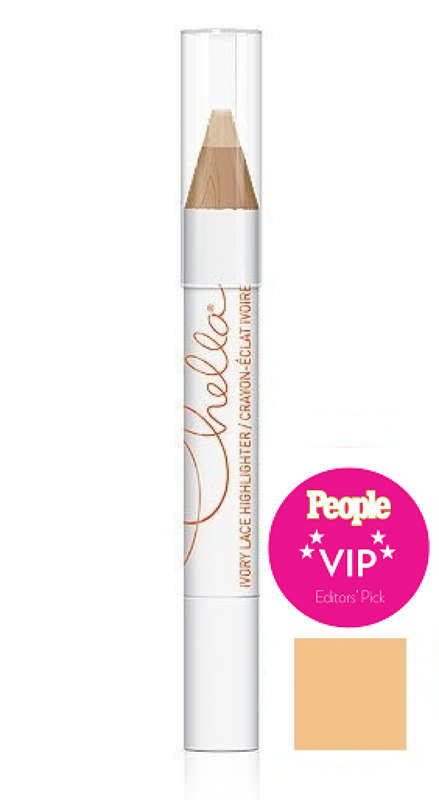 The eyebrow pencils had every feature that I look for in a quality pencil and the highlighter pens are and excellent addition to any makeup bag. Super portable, great quality and easy to use. Other products that I received and haven’t had the opportunity to use or products offered by Chella worth checking out are listed below. 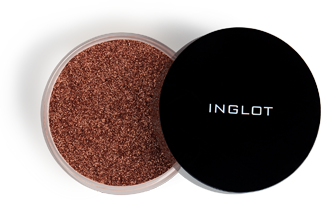 Eye Brow Color Kit – brow pencil, highlighter pencil, brow gel, dual size sharpener and detailed instructions. Chella definitely gets the stamp of approval from me. 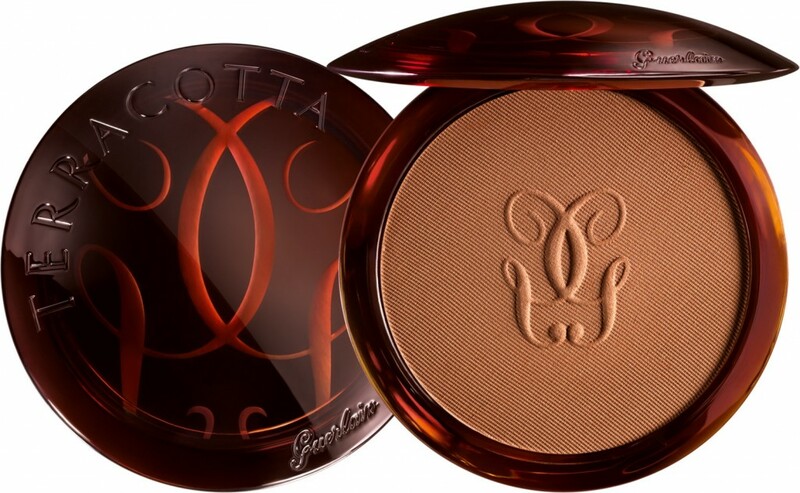 The products are undeniably of a great quality and they definitely did their homework considering product development. I highly recommend Chella. Purchase on-line here or find a brick and mortar location here. I recently did a beauty test with a local NYC modeling agency and beyond clean beauty I was completely stuck on what I should do as a second look. Come early morning before the shoot and I still had nothing. It then randomly occurs to me that the model looks like Twiggy…and BOOM you have a Twiggy-inspired beauty shoot. 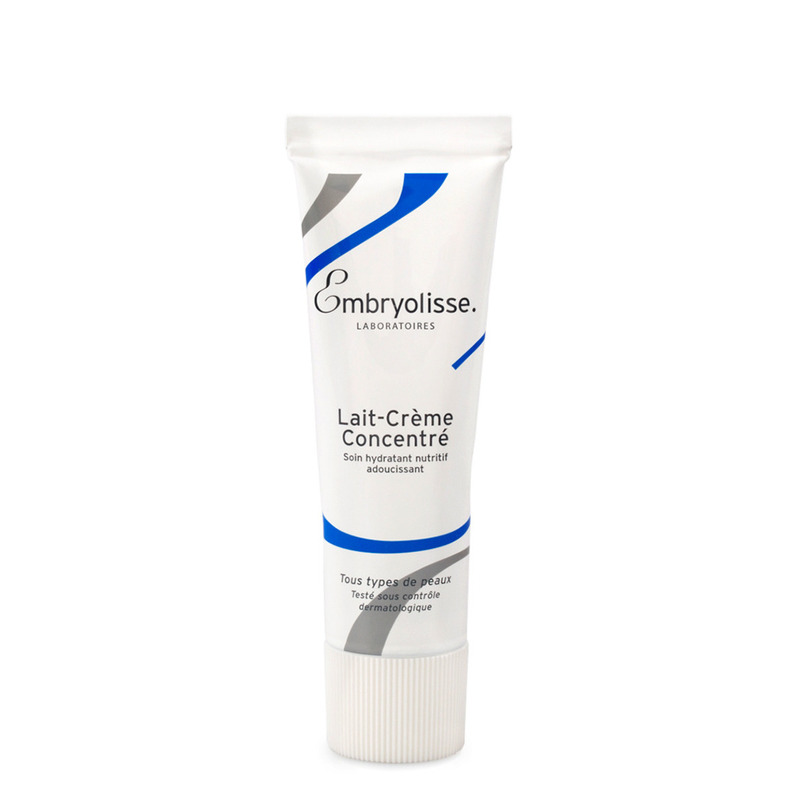 Skin: For the skin I prepped with Embryolisse Lait Creme Concentrate. 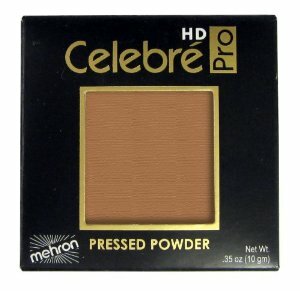 I used Mehron Makeup HD Celebre Foundation and set with Cover FX loose setting powder. 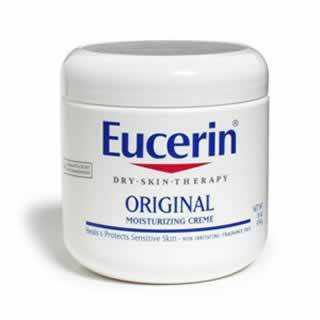 I created a flush on the cheeks by using the Mehron cream C.H.E.E.K. 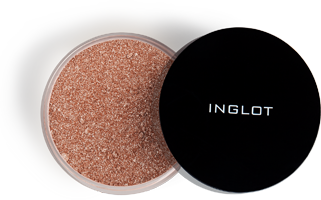 cream color before setting with powder and them lightly dusting a similar colored powder blush over the apples of the cheeks after powder. 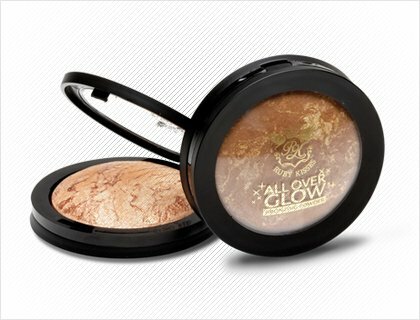 I created a soft glowing highlight using Mehron Precious Gems Powders in Citrine and Diamond. Lips: Lips are MAC Naked Liner topped with a random OCC beigey lip tar. Eyes: And of course, Twiggy’s iconic eyes! I created the graphic lines using the cream base in Obsidian from I Make You Beautiful. The white in the waterline of her lower lashline was created using a Ruby Kisses white luxury liner over another I Make You Beautiful cream base in White Noise. Lashes: (yes, I realize lashes are part of the eyes) These were a custom lash creation using all Kiss iEnvy lashes. I cut up and laid the lower lashes according to how I wanted to shape her eyes. The top lashes are a stack of Kiss lashes in about 3 styles also chosen based on how they would impact eye shape. Twiggy was known for large open rounded eyes and I wanted to be sure to recreate that effect. I absolutely enjoyed creating this look and have a bit of an obsession with graphic lines and lashes at the moment. 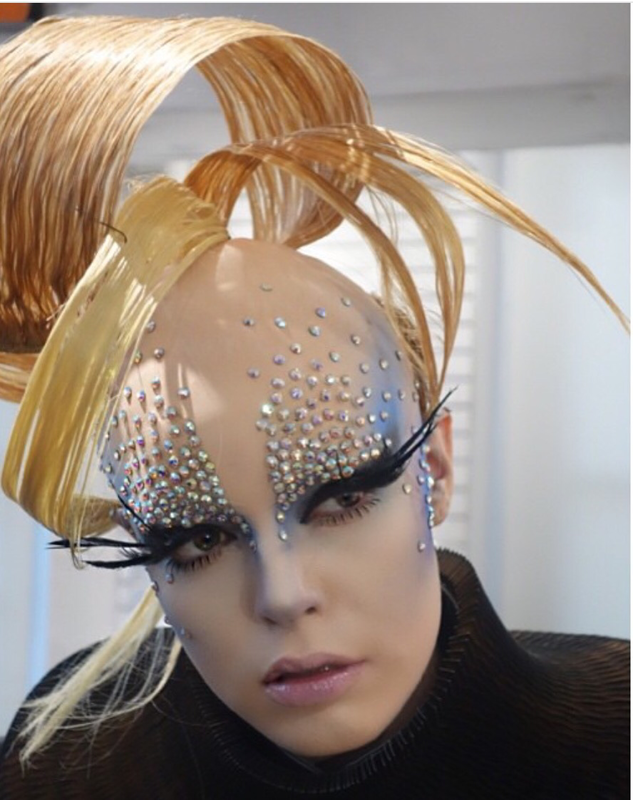 I ended up recreating the look for the “A Night of Mehron Makeup” during The Makeup Show NYC 10 year anniversary celebration. Pretty exciting stuff! Twiggy is officially one of my favorite iconic makeup looks. 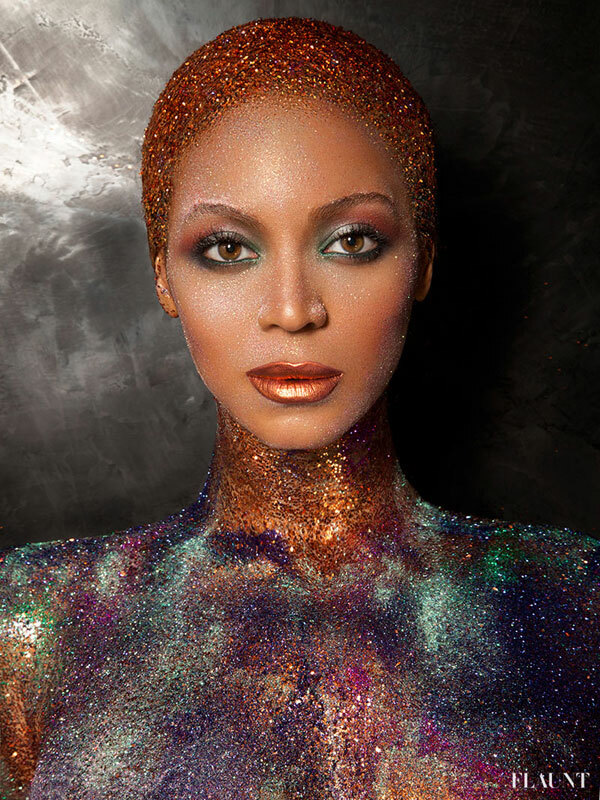 Bey still my glittery little soul! 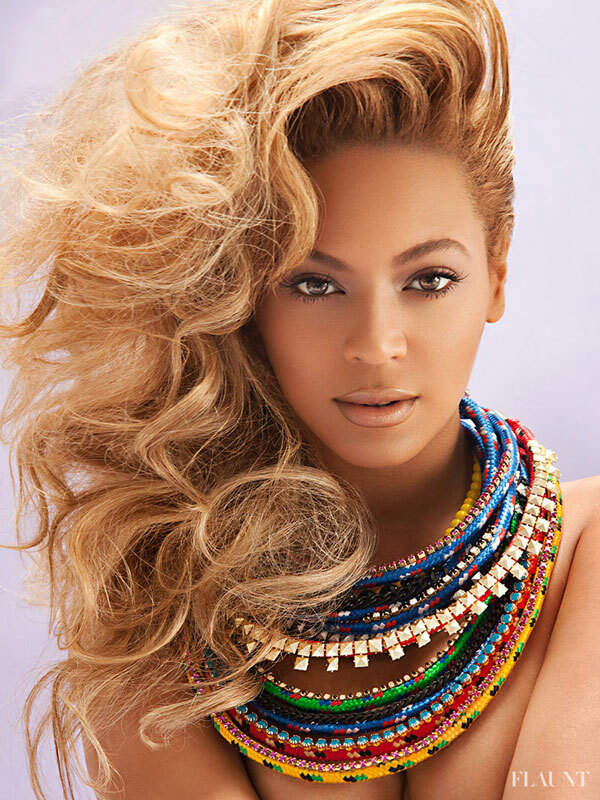 Damn you Beyonce for being so damn fly! WTF IS this! I can’t even ask who are you, better to inquire what are you? 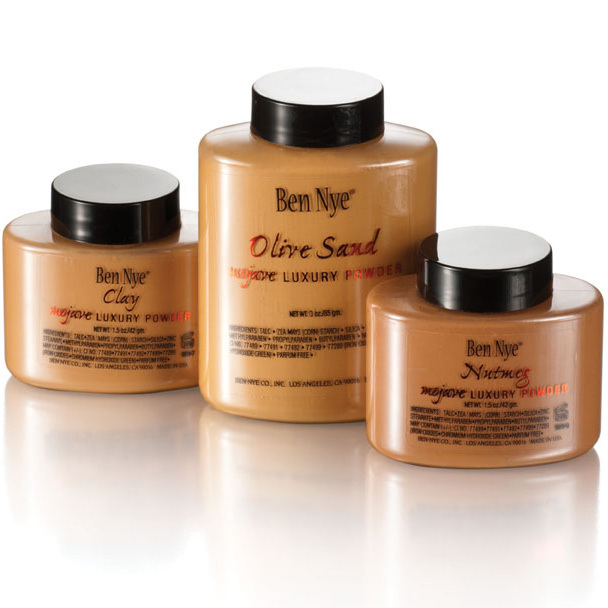 This is the stuff that makeup artist dreams are made of. Granted, I appreciated the interview. 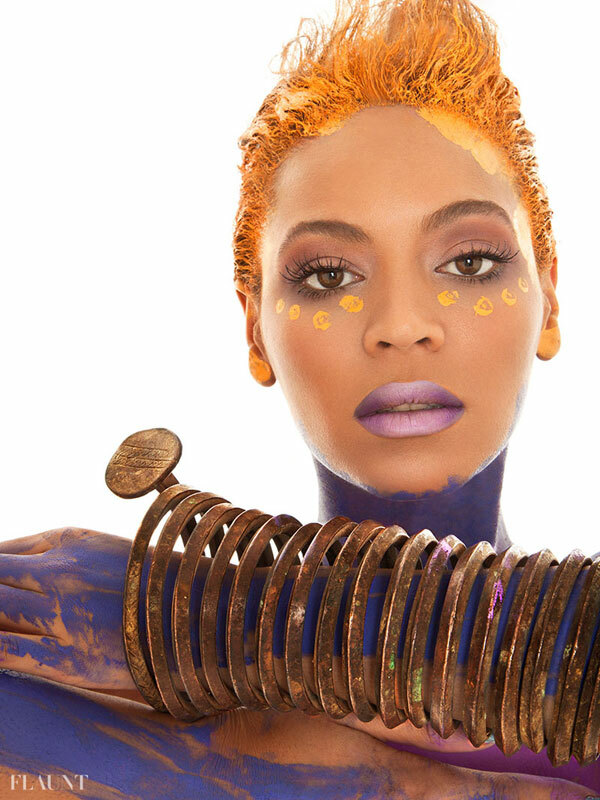 Any opportunity for me to humanize the great King Bey in my mind ifs a necessary one; however, my focus is on this full body beating that Ms. Carter received at the hands of Francesca Tolot for cloutierremix.com and the head snatching magic of the incomparable Kim Kimble. 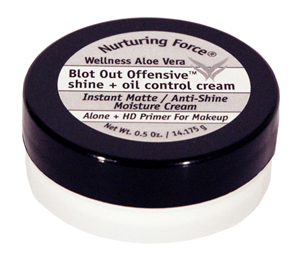 Here are the makeup notes listing products used according to Flaunt Magazine. Beauty Notes: Monoi Body Glow II and Shimmer Eye Shadow in California by NARS Cosmetics, Photo Finish Foundation Primer, Studio Skin 15 Hour Wear Hydrating Foundation, Heat Wave Eye Shadow Palette, and Hyperlash Mascara by Smashbox Cosmetics, and Strobe Liquid, Lustre drops, and Glitter in Amethyst, Bronze, Copper, Emerald, and Very Pink by M.A.C Cosmetics, and Cheek Color in flush by Tom Ford. Now, walk with me. Let’s review these photos and live for just a second, vicariously through the phenomenon known as Beyonce. Sweet baby Jesus of all things beauty! This is sure to be an iconic series of photos of Beyonce. The team that worked on this shoot conceptualized and brought it to life in a way that is incredibly powerful. 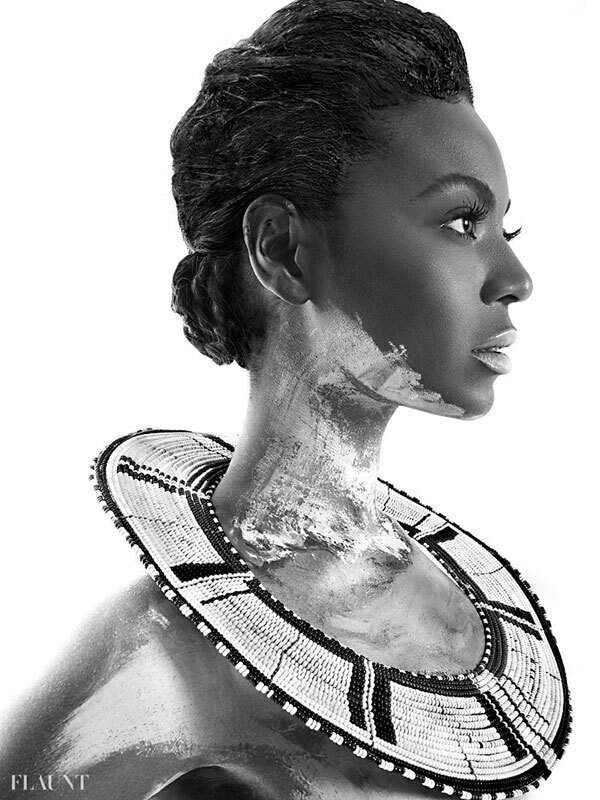 Somehow it progressed from Studio 54 extraterrestrial to a somehow fresh play on the overly culturally appropriated Masai beaded jewelry and then pop-art Hima woman, and worked! Thank you all for giving my eyes and soul a much need visual fix. Read the actually interview here. It’s that time again! When all your favorite pro makeup brands come together in the fashion mecca, NYC for 2 days of shopping, sharing, and shennanigans. Well, shennanigans aren’t a guaranteed a part of my TMS experience, but I’m always sure to infuse a little foolery into those two days. Regardless, it’s important to be properly prepared so that you can make the best out of the show! 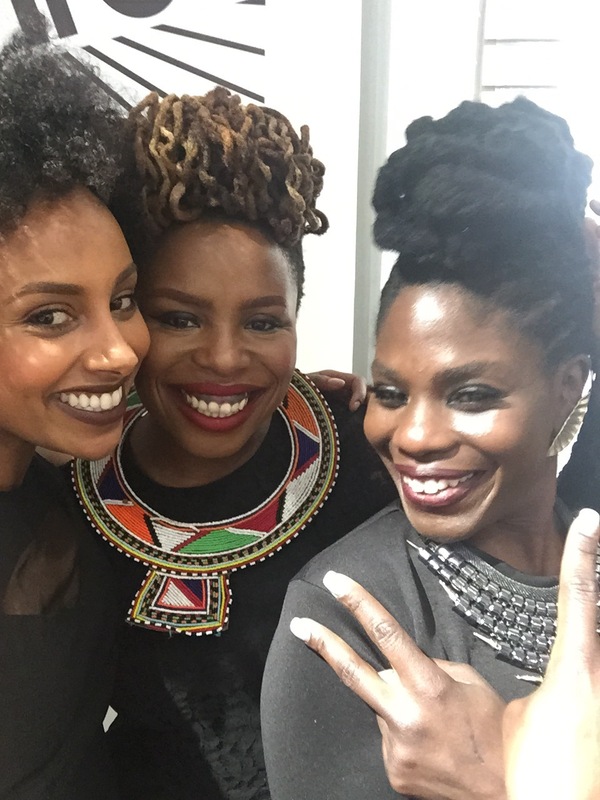 Here are my 10 tips for surviving The Makeup Show NY! Plan ahead. 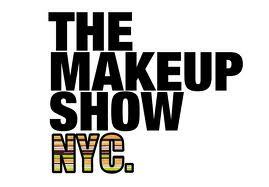 This is hands-down the most important thing to do before you get to The Makeup Show NY! There is an incredible schedule of demonstrations, classes, lectures etc. 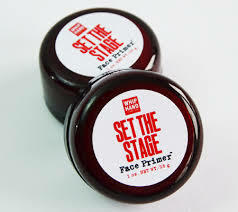 taking place during The Makeup Show and the amount of product available for purchase can overwhelm the most experienced show-goer. There is no better way to navigate the show than to have a plan! Make a Shopping List. Remember tip #1? Meet it’s little sister, tip #2. 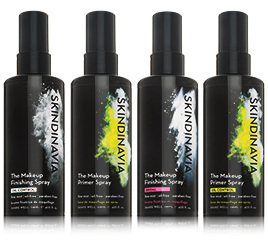 Once you’ve gone through the vendor list provided by The Makeup Show, look at your kit, then back at the vendor list, then back at your kit again. Take some time to figure out what you need to add to your kit and formulate a shopping list based on your needs and what is going to be available for purchase at the show. Now you will have a clear idea of exactly what you need to buy versus what the product junkie in you wants to buy! Bring Cash. In the age of technology it’s safe to say that every vendor will be taking credit cards, but you will be able to get in and out without dealing with processing times. This also helps you stick to a budget for what you actually need to buy. Dress comfortably. Although you want to be a great representation of your own brand, this is not the time to wear your new sequin halter and 6 inch Louboutins. You will be walking, standing, and maneuvering through a massive amount of bodies, so it’s best to wear something that is breathable and comfortable to wear all day. Also, black is not necessary! Network. 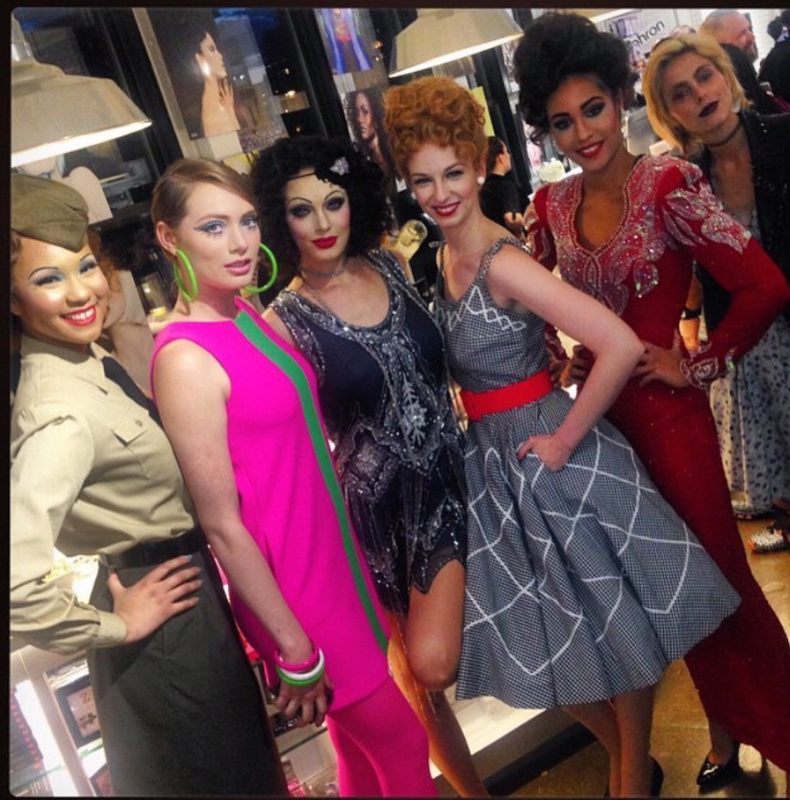 The Makeup Show is not just an opportunity to learn and shop it is also an incredible networking opportunity. 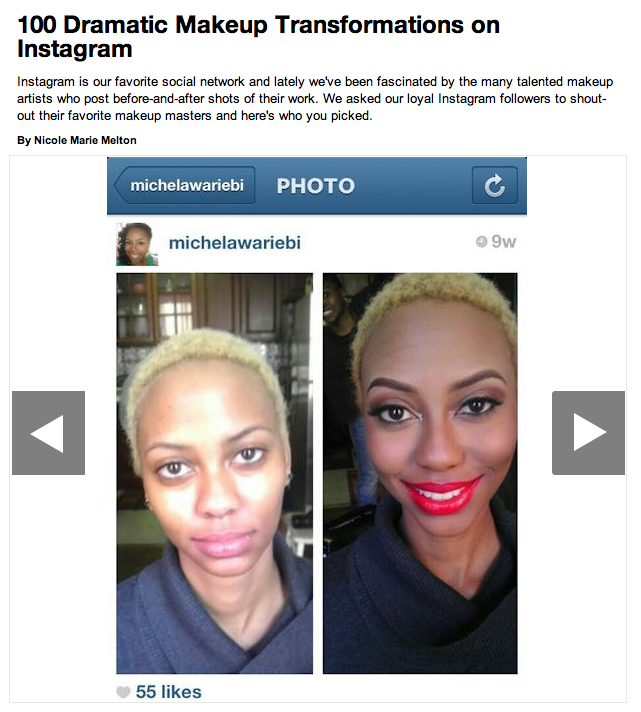 See you favorite beauty blogger, or that celebrity artist who you’re friends with on Facebook? Go say hi! Make sure that you have your own business cards in hand and collect as many cards as you can. If you need help remembering who’s who, write a little note on the back of each card you collect to remind you of who each person is. Take pictures. Do I really need to explain? Inspiration and worthwhile memories are literally bursting out of the Metropolitan Pavillion! Trust me that you will want to commemorate every single moment! Be social media savvy. 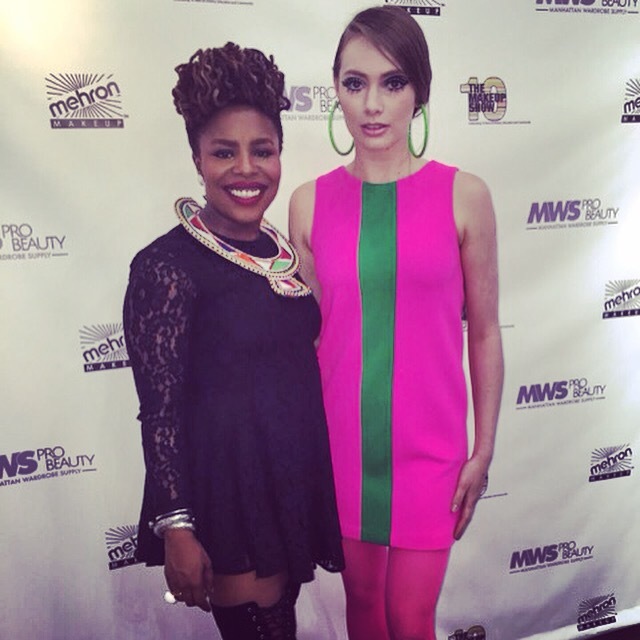 Social media material doesn’t get much better than The Makeup Show. Leverage every opportunity to make yourself visible to brands and people via social media platforms such as, Twitter, Instagram, Viddy, Vine etc. Making a purchase, taking a class, or a chance meeting are all perfect instances to make a post via any social media platform and to tag said brand/person in question! Be courteous and professional. 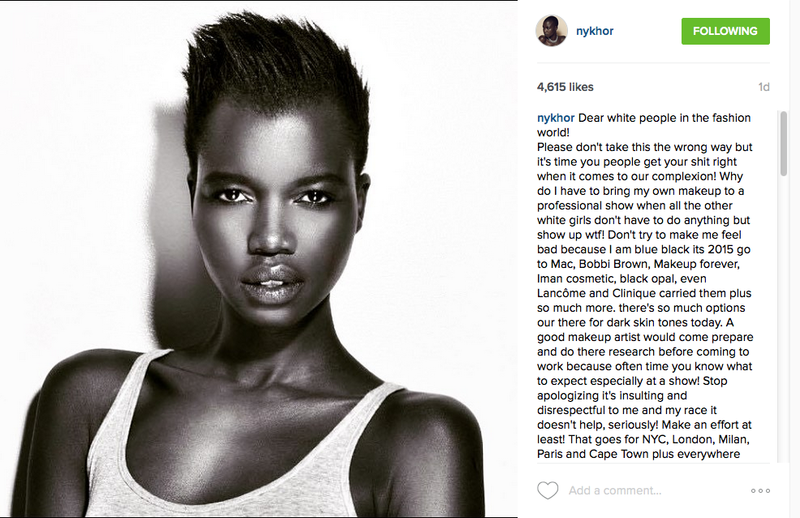 Everything is a representation of your brand and reputation will get you incredibly far in the beauty industry. Be polite and professional in every single interaction because it is the proper thing to do and because you never know who you may be dealing with. Trust me. Ask questions. This is your chance to get in person demonstrations and product knowledge from industry experts. This is also your chance to speak directly with representatives from brands and with artists with which you may want to work. Take advantage of every opportunity to have brand reps give you product knowledge and to find out about opportunities to advance your career! Come visit I Make You Beautiful. This last tip is completely biased, but I want to see all your beautiful faces and all your new purchases! Well, this was a nice little surprise to wake up to this morning. 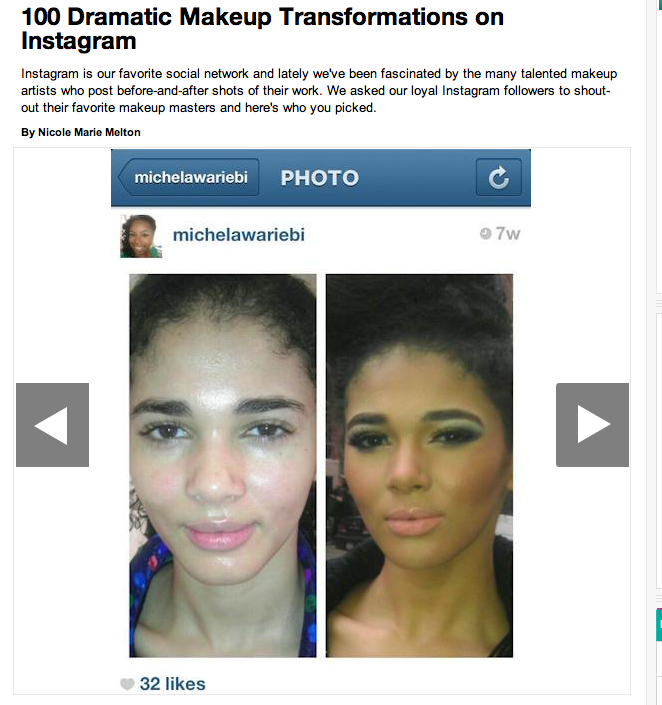 Two of my photos made Essence’s list of 100 Dramatic Makeup Transformations of Instragram. I am proud to be #67 and #68 along with some incredibly talented artists including Sam Fine, Renny Vasquez, and Leiloni Cooper! 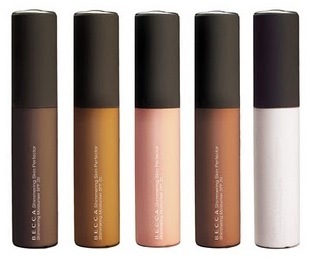 A few days ago Instagram users recommended their favorite makeup before and afters to Essence and I guess this is what they were working on. Feels amazing to know that people think I do great work! Here are my photos that were selected!